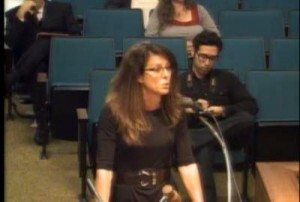 Santa Ana Councilwoman Michele Martinez had a total fit at this week’s City Council meeting, regarding the CDBG (Community Development Block Grants) funding that the city is applying for. These federal funds last year totalled $5.7 million. These funds are supposed to be used “to improve low- and moderate-income neighborhoods and eliminate blight,” according to the O.C. Register. 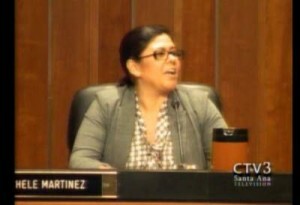 The irony is that Martinez has always voted for the CDBG funds as they have been presented to the Council – but now she is going off about past funding, including funding for a police helicopter that would have otherwise been grounded. I remember when Martinez’ purse was stolen a few years ago. We were actually speaking at the time – she was on her cell phone walking through Downtown Santa Ana to a community meeting. A young man on a bike grabbed her purse and made off with it. The only reason she didn’t lose her phone too was that she was holding it. She immediately called the SAPD and they sent out their helicopter. Ironically she didn’t complain about the helicopter deployment then. In her purse by the way was a police badge with her name on it. Apparently the Council Members all had them back then. Now some gang banger has hers as he was never caught! Now Martinez is requesting that $300,000 in residual funds from this year’s CDBG program be redirected to the Delhi Center for the installation of solar panels, as related during the Council meeting. How is that use of this funding supposed to elminate blight and improve the local neighborhoods by the Delhi Center? Jill Arthur, acting executive director of the city Community Development Agency, pointed out that the Delhi Center is a non profit. Is this an appropriate use of federal funding – our tax money? Click here to read the Delhi Center’s latest financial reporting to the IRS. They’re net assets come to $1.7 million dollars and they pay their executive director, Armando de la Libertad, $150K a year plus another $31K in additional benefits. If these guys want solar power shouldn’t that be their problem – not ours? “Among her questions, Martinez also wanted to know why funding for code enforcement was cut in the latest round of funding allocations. She said the issue is a top priority for city residents. She also asked why council members weren’t involved in decisions regarding leftover grant funds and new city programs using the grant money,” according to the Voice of OC. I don’t know anyone who thinks code enforcement is a priority except for the Usual Suspects who want to see their Mexican neighbors get hassled by code enforcement officers, so what the heck is Martinez prattling about? If you want to eliminate blight I suppose you could ramp up Code Enforcement but how about identifying the real factors behind that blight and trying to do something about that? The reality is that Martinez and her Council allies want to be able to spend CDBG funds on their buddies and to curry political favors. Don’t be fooled by this bunch! I am glad that Arthur stood up to Martinez’ bullying at the Council meeting. This Council is looking more and more like the bunch in the City of Bell that was prosecuted for corruption. Did you see the nice “cut and paste” job, one of the springsters shills posted in response? Come on man, if you are going to steal HUD’s work, at least cite the source Doc! Martinez could barely string a sentence together between the “um’s” and “you knows”! Between this and the Phil Baccerra debacle, it’s clear that the council is just a bunch of crony bound figureheads. Martinez’ traveling womb or not. They should still spread the grant money out in a dozen ways if that is possible. Instead of giving half to the police dept. and another half to a housing contractor that is going to return the favor by funding a future campaign.